Only a couple of weeks to go until the Dempster….. I am leaving Ontario on Tuesday and heading to the Yukon in Northern Canada. It has been well over a year since this idea first crept its way into my head. 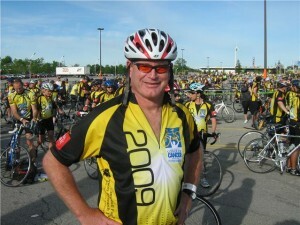 I figured I should be doing something significant to mark my 50th year and that should be a bike ride. Plans for a reunion at an alternative high school I went to in Carcross, Yukon started to come together. So I thought….a trip to the Yukon and a Yukon bike trip. The planning has been fun and stressful at the same time. Over the past year I have asked for and gotten the time off work, convinced my family that this is a good idea, challenged myself to get and keep in some sort of reasonable shape (I know that round is a shape but not the one I am looking for) and looked at all the details and possibilities required for a trip like this. You see, I am not the super athlete type. I have never run a marathon, raced a mountain bike or battled in a downhill skiing race…I am just not that competitive. Besides, my body size is more middle linebacker than bike rider. Challenging myself and competing against others are two different things. The objective of the trip is not “get” to Inuvik but to “go” to Inuvik and there is a subtle difference in those words. I know I can ride 100 km in a day….I know I can get up and do that again the second day. It will be the fifth and sixth day that will be hard. I have had a lot of help along the way. From sage advice given by fellow bikers to the good folks at Axiom lending support….it has already been quite a ride. There has been a great deal of interest generated through my website in support of the Ride to Conquer Cancer, Cameron Helps and the Three Rivers Project and I am happy to help promote these worthwhile charities. I am at the “counting sleeps” point now. I have even been checking the long range weather forecast even though I don’t really think they can predict that far ahead. I know I have forgotten something….it is an age thing….but I am not sure what it is yet. I have scores and scores of lists prepared and the outstanding items are getting less and less each day. 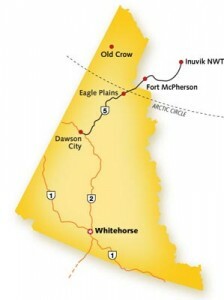 I begin riding on August 4th I will try to check in at Eagle Plains and Inuvik.